Nuts have a bad reputation for being high in fat and calories, but they shouldn’t be avoided for weight loss. In fact, weight loss is a health benefit of regular nut consumption if they are consumed in moderation. Raw nuts contain healthy fat, vitamins, antioxidants, and fiber. Eating nuts regularly has been linked to lower blood pressure and less risk for bad cholesterol, obesity, and high blood sugar. Nuts (walnuts, hazelnuts, pecans, brazil nuts, almonds) contain a special amino acid that offers vascular benefits to people with heart disease and risk of cardiac problems. Because of this, nut consumption is linked to cardiovascular health, lower risk for diabetes, reduced mortality, and a longer lifespan. A 30-year Harvard study found that people who ate a small handful of nuts seven times per week were 20 percent less likely to die (including death from heart disease, respiratory disease, and cancer). Another study in the Annals of Internal Medicine found that middle aged women who consumed a Mediterranean diet including nuts were 40 percent more likely to survive longer without developing chronic diseases (including age-related memory deterioration). Walnuts are one of the best studied nuts and they have high amounts of omega-3’s. Almonds, macadamia nuts, hazelnuts, and pecans are also heart healthy options. To avoid the unhealthy saturated fats typically found in nut butter, substitute a handful of nuts instead. 80 percent of nuts are fat, but they are healthy fats. However, nuts are still high in calories, and should be eaten in moderation. 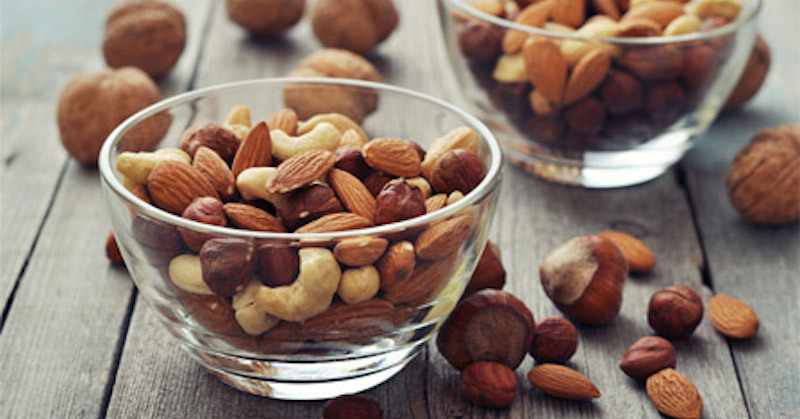 Nuts can be used as a substitute for the saturated fats found in meat, eggs, and dairy. The American Heart Association recommends four servings of unsalted nuts per week. What Is So Heart-Healthy About Nuts? Unsaturated Fats: These are the “good” fats in nuts. Mono- and polyunsaturated fats both lower bad cholesterol levels. Omega-3 Fatty Acids: This is a healthy form of fatty acids that help the heart by preventing heart attacks. They are also found in many types of fish (like salmon), but nuts are a great plant-based source. Fiber: Fiber is known to lower cholesterol, make you feel fuller longer and eat less, and may play a role in diabetes prevention. Vitamin E: Vitamin E helps stop the development of plaque in the arteries. Plaque buildup leads to chest pain, coronary artery disease, and heart attack. Plant Sterols: These sterols are known for lowering cholesterol and are often added to products like margarine and orange juice to give them healthy benefits, but plant sterols occur naturally in nuts. Most nuts’ nutritional makeup closely resemble what I consider to be an ideal ratio of the basic building blocks—fat making up the greatest amount of your daily calories, followed by a moderate amount of high quality protein and a low amount of non-vegetable carbs. That said, some have more ideal ratio than others. My favorite nuts are macadamia and pecans, as they provide the highest amount of healthy fat while being on the lower end in terms of carbs and protein. 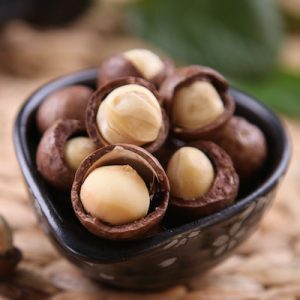 Raw macadamia nuts contain high amounts of vitamin B1, magnesium, and manganese, while pecans boast more than 19 different vitamins and minerals that studies suggest can help you lower LDL cholesterol and promote healthy arteries. Just one serving of macadamia nuts net 58 percent of what you need in manganese and 23 percent of the recommended daily value of thiamin. Moreover, about 60 percent of the fatty acid in macadamia is the monounsaturated fat oleic acid. This is about the level found in olives, which are well known for their health benefits. Walnuts are also known for their health-boosting properties, which includes anti-cancer activity (slashing breast cancer risk in mice by 50 percent, and reducing prostate cancer growth by 30-40 percent), and improved reproductive health in men, just to mention a couple. Just one-quarter cup of walnuts also provides more than 100 percent of the daily recommended value of plant-based omega-3 fats, along with high amounts of copper, manganese, molybdenum, and biotin. It’s thought that up to 90 percent of the antioxidants in walnuts are found in the skin, making it one of the healthiest parts to consume. In some cases, the skin can be rather bitter, which is why most people tend to peel it off, but by doing so you’re actually removing some of the healthiest parts. Even pistachios, while having a more “lopsided” fat/protein/carb ratio, landing them toward the bottom of my list of healthy nuts, still have documented health benefits, particularly for diabetics. 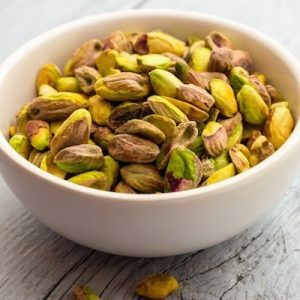 Compared to other nuts, pistachios are high in lutein, beta-carotene, and gamma-tocopherol (vitamin E), and eating one or two servings of pistachios a day has been shown to lower oxidized LDL cholesterol in people with elevated levels. For the greatest health boost, look for nuts that are organic and raw, not irradiated or pasteurized. When it comes to almonds, be aware that even those labeled “raw” are typically pasteurized when sold in the US. The reason for this goes back to a couple of salmonella outbreaks in 2001 and 2004 that were traced back to raw almonds. As a result, as of September 1, 2007 virtually all almonds must be pasteurized before being sold. 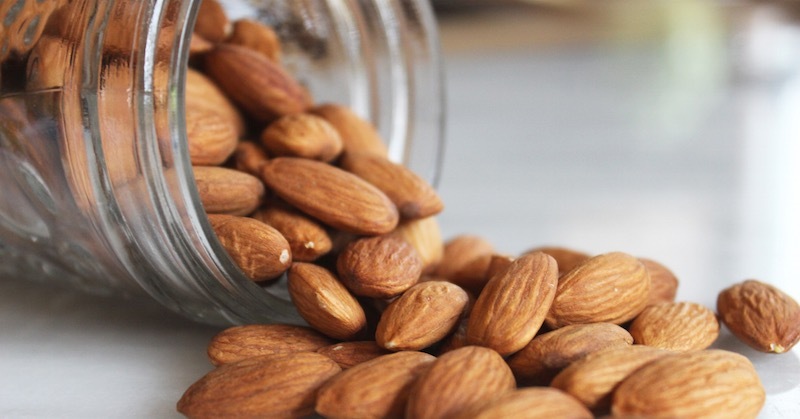 If you want truly raw almonds that have not undergone some form of pasteurization (oil- or dry roasting, blanching, steam processing or propylene oxide (PPO) treatment), you’ll need to seek out vendors selling in small quantities who have a waiver from the pasteurization requirement. Another point to remember when it comes to almonds: As with walnuts, one of the healthiest aspects of this nut appears to be their skin, which is rich in antioxidants (including phenols, flavonoids, and phenolic acids) typically associated with vegetables and fruits. A study in the Journal of Agricultural and Food Chemistry even revealed that a one-ounce serving of almonds has a similar amount of total polyphenols as a cup of steamed broccoli or green tea. Hence to get the greatest benefit, opt for almonds that have their skin on rather than blanched (de-skinned) almonds. When consumed with these guidelines in mind, raw, organic nuts are a convenient and enjoyable superfood to add to your diet, which is precisely why they’re recommended as one of the sources of healthy fats, along with avocados, raw dairy, and butter made from raw grass-fed organic milk, organic pastured egg yolks, coconuts and coconut oil, and grass-fed meats. Peanuts are technically not a nut. They are “nuts” only in their name, but are really a legume. They are grown in the ground, thus are also called “ground nuts”. Aflatoxins: Peanuts are easily affected by aflatoxins that have been associated with various diseases, such as aflatoxicosis, that may also affect livestock, domestic animals and humans. Aflatoxins are poisonous and cancer-causing chemicals produced by certain fungi/mold that grow in soil, affecting decaying vegetation. Peanuts, being a legume grown in soil, are susceptible to this fungi. Lectins: Lectins are a type of protein that can bind to cell membranes. Our bodies aren’t able to digest them, so we often produce antibodies to them. Ingesting lectins may cause flatulence in some people. It causes distress to the digestive systems, possibly even damaging the intestinal lining. Eating foods that contain lectins in excess may lead to a “leaky gut”—a condition where the damaged lining allows various molecules to pass back and forth through the gut wall. Food allergies and autoimmune systems often are a result of a leaky gut. Most common food allergy: Peanuts can cause severe and potentially fatal allergic reactions. 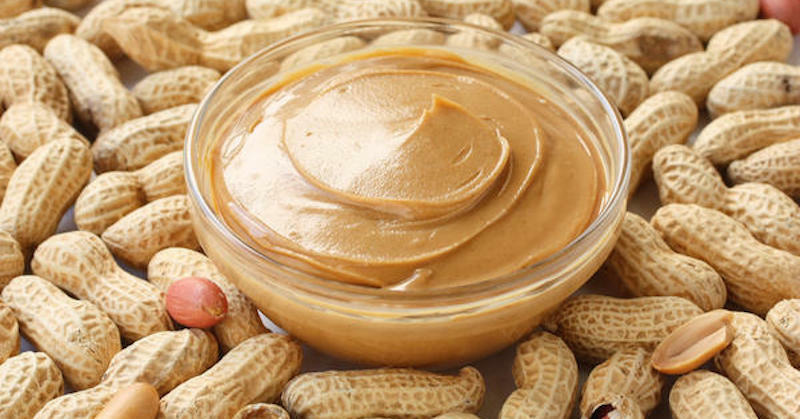 Peanut allergies tend to be lifelong and are on the rise in children. This could be due to the lectin content that cause a leaky gut syndrome. High in Omega-6 Content: The word “Omega” may sound like healthy to most people. Peanuts are high in omega-6 fatty acids and low in omega-3. Your body needs both omega fatty acids but at the right ratio. When this ratio is out of balance, in favor of omega-6 fatty acids, you are at a higher risk of heart disease, diabetes, and stroke. According to various researches, when the ratio of omega-6 fats to omega-3 fats exceeds 4:1, people are more prone to health problems. Inflammatory: Inflammation is a bodily mechanism thought to be the cause of a majority of chronic diseases. Chronic inflammation can cause stress, and many ailments. Peanuts contain toxic mold, lectin, omega-6 and other properties that may be responsible for inflammation. It is also linked to arterial plaque deposits that increase the risk of thrombosis and blood clots. For decades, peanut butter had been promoted to be a “healthy lunch” for kids. Parents are taught that peanuts are a complete meal of protein, carbohydrate and fats. This is far from the truth! Peanut butter contains peanuts and the wrong fats. For all of the same reasons listed above it is also safer to avoid eating peanut butter. Some brands of peanut butter claim “zero transfats” but they can still contain up to half a gram of transfat per serving, especially if hydrogenated oil is listed as an ingredient. Hydrogenated oil is another name for transfat. Transfat is artificial and processed fat, that has been linked to an increased risk of cardiovascular disease. “Reduced-fat” peanut butter isn’t any better. The fat usually found in peanut butter is replaced with added sugar and there is no decrease in calories in reduced-fat peanut butters. A healthy alternative to peanut butter is to make your own nut butter. Homemade nut butter saves money, you can control the levels of sodium and sugars, and completely cut out the preservatives found in commercial brands. Peanut butter can cause of a lot of unknown health detriments, so stay away from it by sticking to healthier nuts and homemade nut butters.